No. 44, Jalan Mutiara Emas 7/4, Taman Mount Austin, 81100 Johor Bahru, Johor, Malaysia. PHK Equipment Company is one of the leading reconditioned electronics material handling equipment suppliers of Malaysia. The products available from us include with different reconditioned electric forklift with different model, reconditioned electronic reach truck, traction battery and a variety of electric forklift spare parts. And we also provide renter and services for our client. Our company builds from 2003.The headquarters of PHK equipment is located in Johor Bahru, Malaysia. We always try to provide our customers the best service with greater responsibility and faithfulness. Our company had growth from 2012 and improved our organization into PHK Equipment SDN BHD. Now, we have become one of the trusted dealers of reconditioned electric and reconditioned electric reach truck. Electric forklift traction battery: – PHK Equipment SDN BHD gives you the opportunity to have the finest traction battery of Electric forklift truck at a reasonable price. Our batteries are long lasting and more powerful than before. We give a warranty for our electric forklift traction battery with 1 year period of time. So, if you purchase our batteries then we can ensure that it could be the best choice for you. 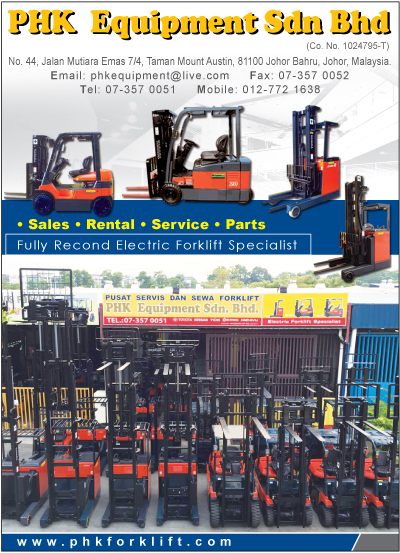 Reconditioned Electric forklift rental: – In Malaysia, PHK Equipment SDN BHD is one of the leading companies which provide the electric forklift rental service. We always think about our precious customers’ need. We provide several model of reconditioned electric forklift according to customer need. Electric reach truck rental: – Electric reach truck rental service is another exclusive service of PHK Equipment Company. If anyone does’t have the capability to buy a brand new electric forklift truck then he has nothing to worry. Because we can give you the opportunity to take rent from our company. The service is available daily, weekly, monthly and yearly.